(AEP/Lisbon) – Two major events marked the centenary of the Associação dos Escoteiros de Portugal (AEP), one of the two National Scout Associations in Portugal, earlier this month: a big birthday party with thousands of participants from all AEP Scout Groups at Jamor National Stadium in Oeiras and a ceremony at the Presidential Palace in Lisbon. The first event was a typical Scout Rally: under the title “Escotismo para Todos – Desafiando Diferenças” (Scouting for all – challenging differences) Cubs, Scouts, Ventures and Rovers and their adult Leaders from all corners of Portugal came together for two days packed with a wide variety of Scout activities to celebrate the hundredth birthday of their association. “It was really great fun. We had many competitions with Patrols from other Scout Groups and were able to try out a number of exciting individual and group activities. And all this on the grounds of the famous football stadium, where the Cup Finals take place every year!”, said one of the young Scouts. And it was a magic moment to see the sea of flags of the different Scout Groups during the brief ceremony when the family photo was taken. 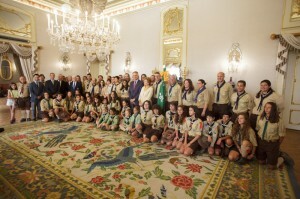 A few days later, representatives of the three oldest Scout Groups of AEP, Grupo 1 (Lisbon), Grupo 2 (Lisbon) and Grupo 7 (Lisbon), who were founding members of AEP and had all celebrated their centenary this year as well, accompanied the Leadership of their association to Palácio Nacional de Belém, where they were received by His Excellency, Prof. Aníbal António Cavaco Silva, President of the Republic of Portugal. Veerle ‘Chip’ Haverhals, recently elected member of the European Scout Committee, joined them and represented the European Region of WOSM at this ceremony. 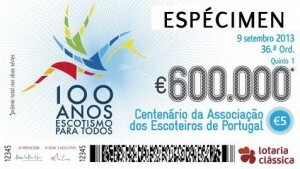 The President had decided to appoint the Associação dos Escoteiros de Portugal a honorary member of the Ordem de Mérito de Instrução Pública, one of the republic’s highest distinctions. It was with a particular satisfaction that he welcomed Scouts to the palace to celebrate the centenary of AEP. The President also highlighted the values of the Scout Movement, which guided the Associação dos Escoteiros de Portugal in promoting environmental education and conservation of nature, outdoor activities, peace education, healthy lifestyle and sport. All these activities continued to stimulate the engagement of Portugal’s young people in their social environment, thus contributing to the full development of their personalities. 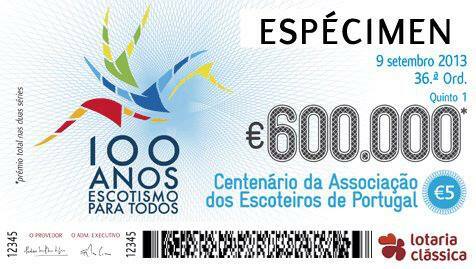 Over the last couple of weeks, the jubilee celebrations were accompanied by a nationwide marketing campaign: a special postcard & stamp available throughout Portugal, a centenary lottery, and a series of 15 different small bags of sugar, all of which will help to reach out to new members as well as attract friends of Scouting in Portugal and around the world.